Five years ago, Fuu and Kou's father passed away. Only recently has Fuu, now a first year in high school, been able to bring herself to look at the photos he loved to take and to pick up the camera he left behind. Between those and her mother's decision to move the family to live with their grandmother in her father's favorite town, Fuu is finally able to move on...one picture at a time. Slice of life shows, sometimes also categorized as “soothing” or “iyashikei,” are very hit or miss if that's not your go-to genre. Tamayura: Hitotose, a series from 2011 recently released on DVD by Nozomi, is a little bit of both hit and miss as it combines some of the more irritating traits of the genre with a genuinely moving story about a girl coping with the loss of her father. It may not make you a genre convert, but it is also charming in many of its aspects, making it a slice of life story that has a broader ranger of appeal than you might expect. The story follows Fuu Sawatari, a small, quiet high school girl who lost her father five years ago in an unspecified illness or accident. Still grieving despite the passage of time – in fact, Fuu expresses a feeling that her time has stopped since her father's death, although there is nothing gimmicky in this, such as a halt in her growth – Fuu's mother has decided to move the family to her hometown of Takehara, where the children's grandmother runs a café. Takehara was a favorite of Fuu's father, and she has not been back there since his death, so while she doesn't say anything, there's a real sense that she has mixed emotions about the return. Her younger brother Kou, on the other hand, seems more excited, and one day she finds him looking through an album of their father's photographs that she had asked her mother to put away. This starts Fuu's life moving forward again, and she reclaims her father's old film camera and begins taking pictures again. 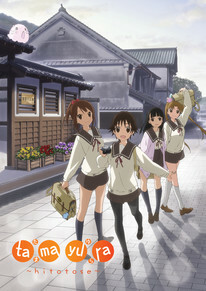 Tamayura: Hitotose rarely gives in to the norms of its genre, despite outwardly wearing its trappings. Fuu, Kou, and Fuu's friends Kaoru, Maon, and Norie all bear the look of cute moe girls, and yes, each girl does have a specific trait or fixation that could serve as her “charm point,” such as Maon's whistling or Norie's obsession with Kou (which is both annoying and creepy), but the story doesn't linger on them overmuch, instead allowing Fuu's grieving process, or rather her release from that process, to drive the story. In the initial OVAs that precede the 12 episode TV series, that takes the form of Fuu trying to relocate the spots where she and Kou went with their father, specifically places that she has photographs of but no actual recall. This allows Kaoru's older sister, the indefatigable Sayori, to inject some humor and familiarity into the story that is not dependent on either moe or the slice of life structure. Sayori, while still arguably a fairly one-note character, is the story's wild child, a young woman with a thirst for little adventures and taking the longest, hardest possible way to get somewhere. She's very much the big sister of the show, even when other mentor figures appear, and her drive to help Fuu settle in and find her past (and come to grips with it) makes her a better and more interesting character than she otherwise might have been. Another way the story rejects an easy storytelling norm is that Fuu already has friends in Takehara: Sayori and Kaoru, whom she knew as vacation friends. While she does have to leave her best friend Chihiro when she moves, there is no (or at least very little) new friend angst, and Kaoru very quickly introduces her to the other two girls in their set, forming a quickly bonded group. This is used to good effect when Chihiro comes to visit, as she is clearly uncomfortable and worried that she might have been replaced, a fear we see Fuu briefly experience when Chihiro begins emailing her about her new friend. These little touches of reality, not harped on but acknowledged, help Tamayura: Hitotose widen its appeal. Despite this, it still has plenty of the regular genre features that may not work for non-fans. The vocal cast, although performing very well, can get very shrill, and the Osakan okonomiyaki shop owner, older photographer Fuu idolizes, and the girls' teacher never move beyond their stereotypes and can all be quite annoying. (Riho, the photographer, much less so than the other two.) A random fluffy pink cat thing called Momoneko gets fairly useless screentime every episode and his own half-episode to just be cute in, and while I am an avid cat enthusiast, even I found Momoneko to be a bit much on the cute front. There are also some odd, cutesified translations, such as “fuwaa” as “floofdoodly” and “na no de” as “so yeah,” which is rather more excusable. Other than those instances, Nozomi's release is quite nice albeit bare – the OVAs are on their own separate DVD in the case and the extra episode 5.5 is placed directly after episode 5 rather than at the end or with the OVAs. All songs are subtitled, which can be a bit of a double-edged sword, as there are numerous cases of insert songs, so that makes for two sets of competing subs on the screen. Tamayura: Hitotose is somewhere between sweet and sappy, a slice of life story with a firm grip on what its emotional content is while still adhering to some of the cuter conventions of the genre. Norie can be a trial to listen to and some of the jokes (Momoneko, Fuu's stuttering/clumsiness) can wear very thin, but at its core this is a lovely story about a girl coping with the death of her father. As Fuu starts her time again, we feel happy for her, and in that sense, this show is a successful one. + Lovely backgrounds and pretty music, really tugs at the old heartstrings when it wants to. Nice touches of realism in some of the plot and characters. − Still has a lot of the moe/slice of life conventions that will not appeal to all viewers, parts of the story get old quickly when not focusing on Fuu's journey. Voices can get very shrill.